Stainless steel is so ubiquitous that we hardly notice it in our lives. But it’s there – in our kitchens and bathrooms, in our machines and the buildings we live and work in. But getting stainless steel to the point where we can safely use it requires it to undergo an extensive process known as passivation. Passivation is the process wherein a substance is changed via chemical action to become inactive or inert. Or in layman’s terms, this is the removal of surface iron with an acid solution in order to prevent rust. Inactive or “passive” surfaces are resistant to reactions, hence materials that undergo the passivation process corrode far more slowly than those that didn’t undergo passivation. Most metals, like aluminum and titanium, are “self-passivating” so it forms an outer layer of oxide that’s quite resistant to corrosion. However, if these materials come in contact with steel – during the fabrication of parts or through iron particles from shop tools – trace amounts of iron will be left on the surface and rust will set in. The same scenario also happens in stainless steel and other corrosion-resistant alloys. Its components form a surface layer that protects the steel, but contact will expose the iron and hasten rusting. 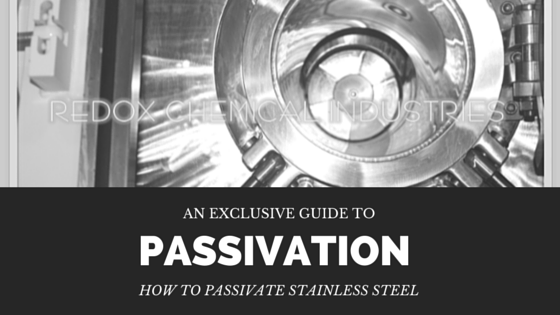 This is why passivation is the final process in the manufacture of stainless steel parts. It’s also a process that needs to be conducted on a regular basis. What are the Passivation Processes? Cleaning is always the first step in the passivation process. Dirt, iron chips, grease should all be carefully wiped off the stainless steel part before the passivation process begins. High-grade degreasers or cleansers are often used to clean off oils or coolants while other foreign matters can be removed from the steel surface by grinding or acid pickling. After thoroughly cleaning the stainless steel part, it will be submerged in a passivating acid bath. There are three types of baths that can be used – nitric acid passivation, nitric acid with sodium dichromate passivation and citric acid passivation. The type of bath used would depend on the grade of the steel and its acceptance criteria. For instance, chromium-nickel steel is often passivated in a nitric acid bath while straight chromium are better off immersed in sodium dichromate baths. While nitric acid has traditionally always been used in passivating acid baths, citric acid is becoming more common these days. It’s safer, doesn’t harm the environment and is considered more effective. As previously mentioned, the use of metals, like stainless steel, is already a part of our daily lives. So it is crucial that a protective layer is formed on any steel instrument that we use (ex. knives, cutlery, machinery, cooling coils to ensure that its integrity is not compromised. The presence of a well formed passive layer will undoubtedly increase the material’s resistance to corrosion, thereby increasing the product’s life span. What are the Advantages of Passivation? There are a number of reasons why it’s advantageous for stainless steel to undergo the passivation process. One advantage to using this system is that it improves the materials resistance to corrosion. It also gives a smoother and more uniform finish to the material, making it more aesthetically pleasing. The passivation process also cleans the product and in turn, makes it easier to clean as well. Lastly, the passivation process protects the steel, thereby improving and extending the life of the machine or product. Redox Chemical Industries Philippines is the industry leader in passivation services, delivering the highest quality of passivated products to our customers. Here at Redox Chemical Industries, we offer on-site passivation services on all types of metals with a focus on stainless steel. Call or contact us today to speak or request for a quote about passivating!